Human beings are visual creatures – we like to see things that we buy – the more details the better. In the world of digital marketing and trade, establishing trust with target customers is of crucial importance. Again, in order to achieve this, sellers rely on well-developed and maintained websites that provide as many information to the customers as possible without appearing drab and completely technical. Visual representation of the items for sale and its approachability are the two essential items the sellers must bear in mind. On this note, and the fact that website development is rapidly developing in the direction of simplicity and approachability, the need has arisen for a plugin that will enable well-balanced visual/descriptive/audio representation of products for sale. 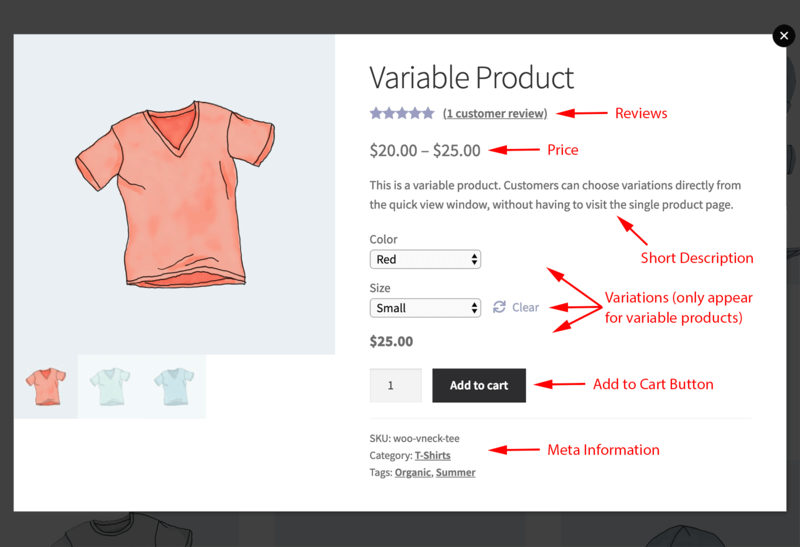 This is why the WooCommerce Quick View Pro has been developed. Possible applications of the plugin are endless. The developers had in mind restaurants, wholesale stores, music/video shops, and photography websites among others. In all the mentioned cases, and their websites, simplicity is of the utmost importance – visual representation of the items, option to zoom in the picture, choose the quantity, size – all this information must be at the customers’ fingertips. In many cases, the customers are visiting these sites via their mobile phones (with quite small screens) and the image/description ratio must be taken into account. The WooCommerce product pop up is a fantastic way to ensure the image and description on the screen will be the best quality and size the customer can see on their device. After purchasing the WooCommerce Quick View Pro, the plugin files can be downloaded and the license key can be copied directly from the Order Confirmation page. The buyer automatically receives a confirmation email (in addition to the PayPal receipt) together with the license key and a download link to the plugin. Should this email not arrive, it is recommended to contact the seller. After downloading the plugin, on the dashboard of the WordPress page, it is necessary to go to Plugins -> Add New -> Upload Plugin. Here, the admin clicks ‘Choose File’, selects the “woocommerce-quick-view-pro.zip” file just downloaded and clicks ‘Install’. After finishing the upload, the admin clicks ‘Activate’. Then it is necessary to go to WooCommerce > Settings > Products > Quick View and enter the license key. This can be obtained from the Order Confirmation page and the email confirmation delivered after the purchase. Here, it is recommended to save changes to validate and store the license key. The Quick View settings need to set next. 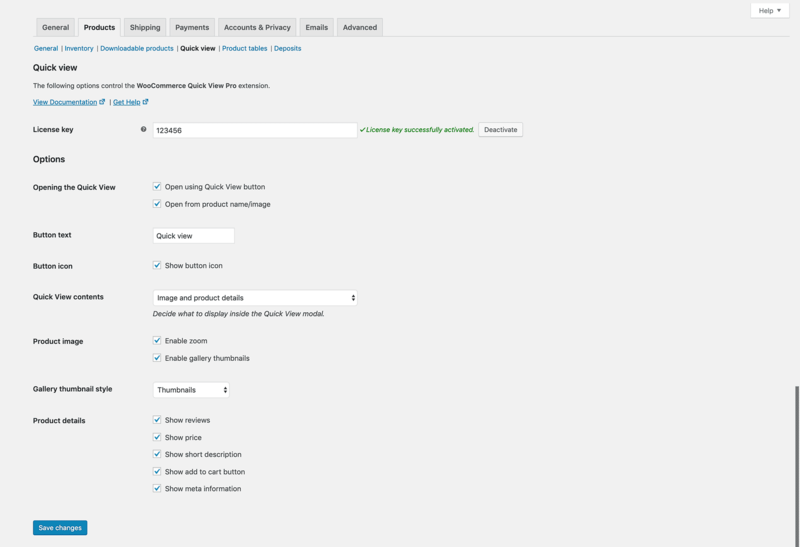 The WooCommerce Quick View Pro plugin settings page (WooCommerce -> Settings -> Products -> Quick view) enables changing the appearance and content of the quick view. The license key needs to be entered here. This is crucial for the plugin to work. WooCommerce Quick View Pro has been designed to appear approachable and attractive with most themes. The WooCommerce product has pop-up features that make the site appear more professional and attractive. Whenever possible, it will take over the elements from the site’s theme such as the fonts and button styling. However, should the need arise, it is possible to change the styling of the quick view buttons or lightbox – especially in the case the site’s theme has overridden some of the standard WooCommerce styles, which in turn may disable some of the styling elements in the quick view. The quick view buttons or the content of the lightbox can be changed by adding custom CSS to the theme or child theme. It is strongly recommended to never modify the plugin itself, since the changes will be overridden when the plugin is updated. The developers also warn against changing the CSS in the quick view plugin since the changes will once again be lost when the plugin is updated. It is also possible to leave both boxes unticked to disable the quick view. This option enables controlling the text that appears in the quick view button. Depending on the purpose of the quick view, it is possible to reword it to ‘View’, ‘Customize’ or ‘Show Gallery’. This option enables displaying a quick view ‘eye’ icon in the button. When this option is on, along with the add button text in the field above, then the button contains an icon and the text. On the other hand, when this box is on but the ‘Button text’ field is left blank, the button only contains an icon without any text. Image only – this option enables the quick view lightbox show the product featured image, along with any additional images when the gallery is enabled. This option is primarily for displaying larger images or multiple images in a lightbox, with no additional information about the product or purchase details. This may be a good solution for a photographer in combination with the ‘Open from product name/image’ option mentioned above to provide bigger versions of the images for sale. Product details only – with this option the quick view lightbox shows extra product information or purchase options, without displaying any images. This is a good option for selling non-visual products that rely more on the product description, features and options rather than images. Image and product details – This is the most popular option since it replicates the top part of the single product page in a characteristic WooCommerce store. On desktop layouts, the product images are shown on the left and the product details are displayed on the right. On small screen sizes, such as smartphones, the layout stacks and the images are shown at the top, and the product details underneath. Enable gallery – when images are uploaded to the product gallery section of the ‘Add/Edit Product’ screen, this option displays the thumbnails of the other gallery images underneath the main product image in the lightbox. 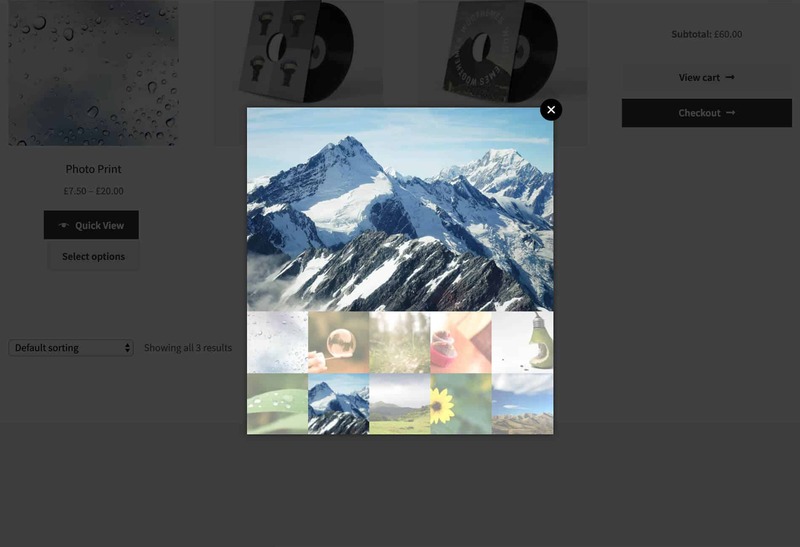 By clicking on a gallery image, WooCommerce product pop up enables seeing a bigger version of it above. Enable zoom – This enables zooming in to view a close-up version of the image when the cursor hovers over it. The zoom only works if the image size shown in the quick view is smaller than the uploaded product image file. Show reviews – average star rating is shown as well as the number of reviews, and a link for reading full reviews. It is important to bear in mind that this applied only for products that have reviews. Show price –product price is shown under the name and reviews. Show short description – product summary/short description that was placed at the bottom of the ‘Add/Edit Product’ screen is displayed with this option, unlike the long product description which does not appear within the quick view lightbox. Show add to cart button – add to cart button in the quick view lightbox is displayed, as well as other information (related to purchase – quantity, variations, and any additional options – for users of the Product Add-Ons extension). It is important to notice that this only applies to products that are purchasable in WooCommerce. Show meta information – meta information about the product is shown at the bottom of the quick view lightbox. This option can vary depending on the product and can cover additional information – categories, tags, and the product’s SKU code. In order to use this WordPress plugin for a multisite, a license for each sub-site where it will be used is required. Thus, in case of a multisite comprised of 5 sites, and a necessity to use this plugin on all of them, the license must be bought for all 5 sites. However, in case that the plugin will be used only on 1 site, a single site license will be sufficient. The license key should be entered on the plugin settings page for each site where the plugin will be used. In order to update the plugin regularly, the plugin needs to be network activated even when used on one site within the multisite. The plugin can be tested on the demo site. In addition to this, the developers offer a no-questions-asked money-back guarantee instead of a trial period. A full refund can be provided within the first 30 days since the purchase. This package covers using the plugin on one site; thus in case of multisite, each sub-site counts as a separate site. Email support and updates are also covered, meaning that the user will have access to regular plugin updates (new features, security updates, and other improvements), and annual renewal – the license is valid for 12 months and will be renewed annually until it is canceled (In case the users decided to not renew the plugin, they can keep using it but no further updates or support will be provided after the expiration date). This package covers up to 5 sites – in case of a multisite, each sub-site is counted as a separate site. Priority support and updates are provided in this package. This means that the users will receive priority email support, with the guaranteed maximum timescale of 4 hours for initial request and 24 hours for follow-up. As with the personal license, the user has access to regular plugin updates, as well as annual renewal. This package covers up to 20 sites – in case of a multisite, each sub-site is counted as a separate site. 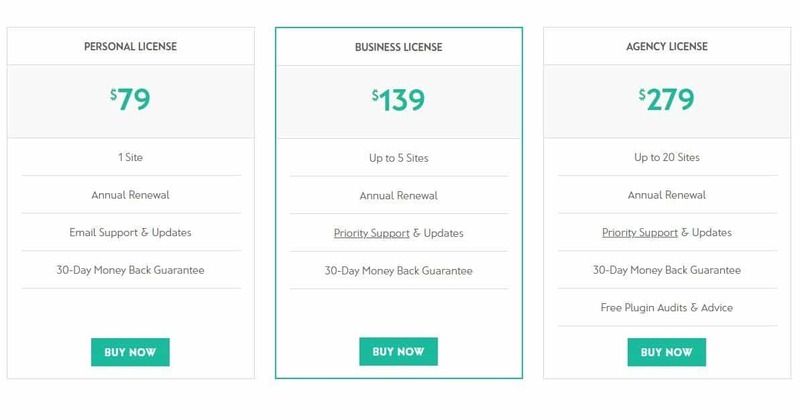 Just like with the business license, this package offers priority support and updates, regular plugin updates, as well as annual renewal. In addition to this, this package offers free plugin audit and advice – meaning that the user can contact the developers at any time for expert advice on how to use it more effectively to meet the business objectives. The plugin is newly developed and so far has received only 5-star reviews. The users praise the plugin as the best value for the money that can be found on the market. The WooCommerce product pop up makes the site stand out in its simplicity and professional appearance. The support team responds to email inquiries within 24 hours and is very informative and prepared to offer additional clarifications. Since the developers offer a full refund within 30 days, the investment is minimal. This plugin is a must for any professional who does not want to waste their time and money with professional admins. Its user-friendly layout, forthcoming support team and variety of features available make the WooCommerce Quick View Pro the best investment a website owner can make. Published on March 6, 2019 under woocommerce.